Why Are Some Words Better for Your Marketing? Choose them carefully. The words we use matter. There are over 1,000,000 of them in the English language. Most of them are terrible for your marketing. Some work better. Much better. Some words are simple to understand. Others require a bit more work as they bounce around in the readers brain. They require more knowledge and education. Any sentence can be measured on a readability scale, which correlate to education levels, from 12th grade (more difficult to read) to 4th grade (easier to read). Not every visitor on your website is a college graduate. If you’d like a rough estimate of the education level of your visitors, head over to Alexa. Not everyone on your site has a PhD. In fact, some estimates suggest that 30% of internet users are low-literacy readers. That’s a lot. When the NN Group rewrote a pharmaceutical website to bring the readability level down to an 8th-grade level, the success rate for low-literacy users went up. A lot. 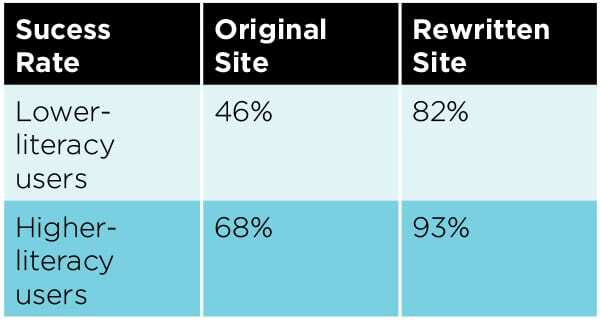 When the site was more readable, these visitors were 135% more likely to complete tasks. But surprise, surprise! The success rate for high literacy users also went up. That’s right. All visitors prefer to read at 8th-grade level writing. That means simple words. As you choose from the millions of words available to you, pick the easy ones. Write like the Dude. Not like Lord Grantham. Note: For the record, the readability of this article is about the 6th grade level. Why Do We Utilize Complex Vocabulary Use Fancy Words? We do it because we want to sound smart. But we’re taking a risk. When we try to make ourselves sound smart, we might make our audience feel dumb …and that’s bad for the success rate of our websites. Your readers don’t know your jargon. They’re not in your industry. They’re not looking to be impressed. They’re looking for information. So drop the jargon. It’s dangerous to your marketing. In the business of web design, there are a ton of industry terms. But we have to very careful about word choice. All of these tactics can grow your total number of visitors! Fun, right? Here’s the full list of 131 words that increase website traffic. How Much Are Visitors Reading Anyway? Now that we’ve carefully picked the right words, let’s be honest with ourselves: people aren’t going to read them all. In fact, people won’t read most. Yes, there’s a good chance you’re skipping this sentence. 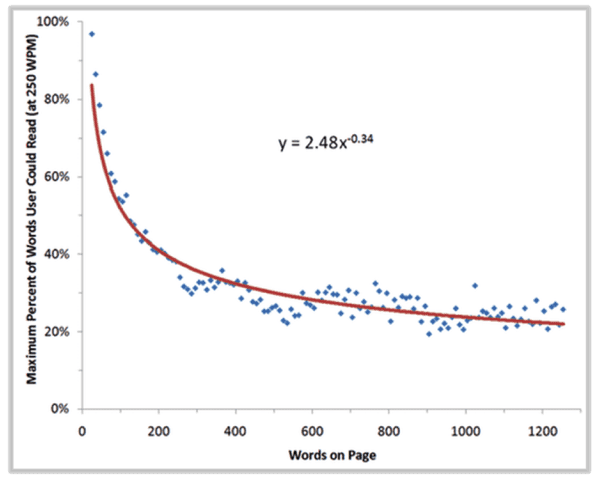 Another study by the NN Group looks at the average number of words per page, the average time spend on pages and the average reading speed of 200 to 250 words per minute. What did they learn? Website visitors read only about one in five words on any web page. So Now What? How Do I Write For People Who Don’t Read? The answer is to write for scanners. Website visitors, you and me included, scan pages more than we read them. So we must adapt for scanners. And there are some simple ways to do it: with formatting. Break up your pages into sections with meaningful, descriptive headlines. Call out the text that is most important for them to read. You should almost never write a paragraph that is longer than four lines. Long paragraphs get skimmed. Very long paragraphs get skipped! Links are usually another color and underlined, making them stand out among the text around them. This guides the visitor’s eyes down the page, toward the actions you’d like them to take. Formatting is actually more important than word choice. The best, most compelling words will never be read if they’re trapped within a huge, dense block of copy. That’s just how it is. Great structure pulls the reader in. Great writing keeps them there. Yes, that statistic is the best example of why we should all avoid jargon in our marketing. Never underestimate how little other people know! Thanks for the comment. Glad you enjoyed the post, Noya. Fantastic post, Andy. Funny, smart, helpful. A good reminder, thank you! Thanks for dropping by, and for the comment, Julie! A great reminder of something that I think we take for granted and a good excuse for everyone to re-check their own site. One thing that that I was never a fan of was using the term “Search Engine Optimization”, but terms like “Getting Top Results”, et al, sound like of spammy. The newer terms “Inbound Marketing” and “Content Marketing” are a little easier for non-marketers to digest and remember. I agree about the term “SEO.” The same survey by the LA Times found that 77% of respondents didn’t know what that means. But it’s such an important topic, this is something that I really struggle with. I have strong opinions about the use of “inbound marketing” vs. “content marketing” but that’s a topic for another post! Great post. There is a little known readability utility built into Word. They use the Flesch-Kincaid test developed by the military to ensure technical manuals can be comprehended by all (http://en.wikipedia.org/wiki/Flesch–Kincaid_readability_tests). Here is short video that shows how it works. https://www.youtube.com/watch?v=wYQ9CbHBnq0 Sometimes we shoot for 8th grade level but most of the time we shoot for ‘busy executive’ level in our communications. Trying to follow your advise. I have to admit that even though I’m a self-employed copywriter, I do the exact same thing and read 20% of a post if that. Usually it’s to get to what I actually want to read. Do have to agree that many businesses love to use dense, fancy, and “businesslike” tones on their blogs and website pages. I educate them to go casual because few human beings want to sift through all the jargon to get to what they want to read. 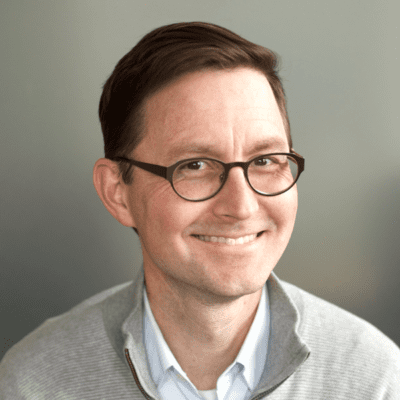 Andy – how do you overcome when clients object to using simple, conversational language? LOVE this, Andy! Sometimes we get so carried away with jargon and $10 words that we leave the reader scratching their head, wondering what they just read. Simplify, simplify, simplify! I thought HTML was a new boy band. Avoiding obfuscation is eminently more commanding than using pretentious modifiers and descriptors. This is such great info, thanks! I have to say, I’m in the middle of research/rewrite for a B2B site and it seems to help (a LOT) when using a bit of jargon of the target business. Some informal surveys we’ve done indicated if we simplified and “explained out” some basic concepts the feeling was the writer didn’t understand the environment of the reader. It’s a balance! These days I try to default to the almost-to-jargon approach. This aggression will not stand man. The Dude is awesome and this lesson in readability is also directly related to search. It’s much more likely your target readers are using simply terms- not technical- to search for your content. Things that make you go hmmmmm. Thoroughly enjoyed reading this. Thanks again Andy! This is a fantastic post! Thanks for your insights and thoughts. I’ll be honest, not only was this easy to read, but I was really impressed by the small progressing bar at the bottom. It propels you, visually, through the article. Nicely done! Brilliant! Absolutely. Obviously the overall sense of the post is well known…what makes it stand out is how you wrote it: as a perfect sample of your advices. Keyboard scientist you are!! ;o) Thumbs up! I always wanted to learn marketing. Education is an important part of the development of any person. Some skills we can learn only by ourselves. A lot of useful information can be found here: https://tooly.io/ . There are articles on various topics and you will definitely find something interesting for yourself. Learn!